In the Second World War the male workforce of Britain were largely directed into the Armed Forces, and from early in 1942 women in their late teens, without domestic responsibilities, were required by the wartime government to take up work either in factories or on the land to support the Home Front and to maintain the production of munitions. Marie Nuttall, a young Manchester office worker, chose to join the Women’s Land Army and her first posting was to a dairy farm at Godmanchester, where her jobs included delivering the milk, in a churn, around the neighbourhood by pony and trap. 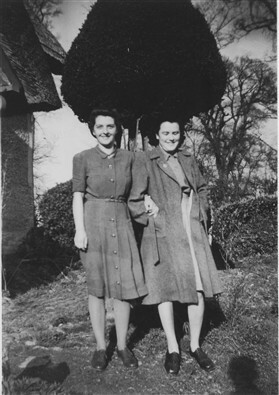 After a month at Godmanchester she was transferred in April 1942 to Orwell to work at Malton Farm for the Marr family and was billeted first with Revd and Mrs Clapton at Orwell Rectory. She remembers going for a walk with Ivy from Liverpool, another Land Army recruit, soon after arriving here and finding the countryside so quiet that, if they could have found a railway station, both would have gone straight home again! However, despite the culture shock, farm work, though physically hard, was often fun for the girls and they appreciated the respect of the other farm workers. Marie lodged for most of her war service with the Pearce family in Fisher’s Lane and enjoyed Mrs Pearce’s wonderful cooking, especially her cooked breakfasts. Country folk, with access to allotments and vegetable gardens, were generally quite well fed despite war time rationing and extra rations of sugar, margarine and bread were issued to the farm workers at harvest time. Work on the farm began at 7.00am when American bombers were heading for Germany from nearby RAF Bassingbourn. “We counted them all out and, later on, counted them all in again.” Sadly some did not return; some came back badly damaged, with injured crew, and went straight in to land, while others had to circle and wait their turn. Memories of a fatal crash at Malton still distress Marie as she remembers being sent with a message to the rescue team at the crash site. Marie’s first job at Malton was to join village women in hand-setting 35 acres of potatoes – a back-breaking task! Then came hoe-ing, hay making and harvest. Land girls based at Wendy came to help out, but on one occasion they enjoyed a bit too much refreshment in the form of cider and dozed off on the hay! At harvest time men and girls worked in gangs of three to get the shocks of corn from field to barn, with one pitching shocks up to the cart, one loading and one driving the tractor. In 1945 a combine harvester changed this way of working, but on one occasion the ‘combine’ caught fire and Marie had to help beat out the flames with wet corn sacks. Later they were each paid £1.00 for their efforts from the farm insurance. In October there were potatoes to be lifted, with extra help from Italian prisoners of war; corn had to be threshed during the winter and some was ground for animal feed. Marie had a part in all these tasks, but her Land Army days ended when she married fellow farmer worker Ernie Freestone in 1946 and made Orwell her home for ever. This page was added by Ian Freestone on 03/10/2015.